Our Foodshed Conservation Plan outlines a roadmap for protecting the agricultural land that supplies fresh, local food to the people of the Hudson Valley and New York City. Conserving farmland protects our supply of fresh, local food. Right now, lawmakers New York City are making budgetary decisions that could have a major impact on the future of Hudson Valley farmland conservation. You can help protect Hudson Valley farms and our supply of fresh, local food. See this page for details. Call the Mayor’s office and your Council member and urge NYC to protect its foodshed by investing in Hudson Valley farmland conservation. You can call the mayor's office by calling 311 (or 212-NEW-YORK outside NYC). You can use this page to identify your council member and get his/her contact information. 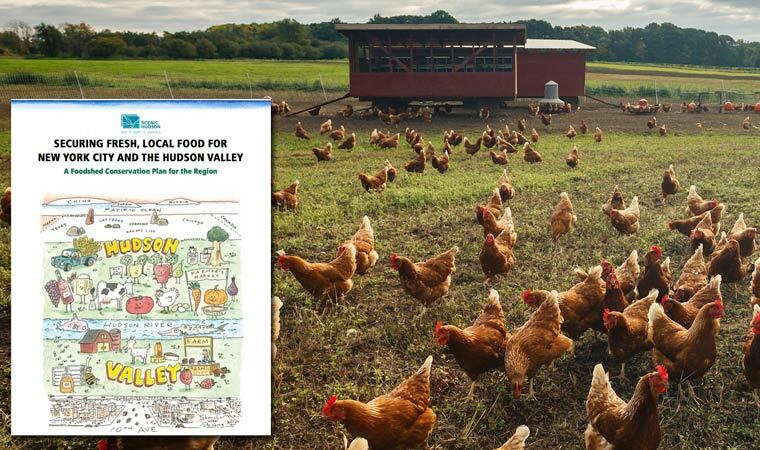 Securing Fresh, Local Food for New York City and the Hudson Valley: A Foodshed Conservation Plan for the Region — Scenic Hudson's illustrated foodshed conservation plan for the region — is available as a downloadable PDF file. Printed copies can be requested by sending an email to bmyers@scenichudson.org. In June 2013, Scenic Hudson released a groundbreaking study that offers a blueprint for ramping up collaborative farmland-protection efforts. "Securing Fresh, Local Food for New York City and the Hudson Valley: A Foodshed Conservation Plan for the Region" prioritizes unprotected farmland throughout the valley. It will allow stakeholders to focus on preserving those agricultural lands most critical for meeting increasing demands for nutritious local food. Underwritten by the Doris Duke Charitable Foundation, the study is believed to be the first-ever comprehensive, data-driven strategic plan to conserve farmland in a metropolitan foodshed. Additional information is available in this news release and in this public radio report. A PDF version of the plan can be downloaded via this link. Printed versions can be requested by contacting bmyers@scenichudson.org.